Sidney Richard Percy was, in his own lifetime, one of Britain's foremost landscape painters, acknowledged by his peers and Royal Academicians. His work is usually finely executed in detail, harmonious and pleasing in composition, and conveys a unique and easily recognisable style of his own romantic realism. Percy sketched directly from nature and travelled extensively throughout the British Isles in search of beautiful and remote locations. Much of what he saw we can still see today. 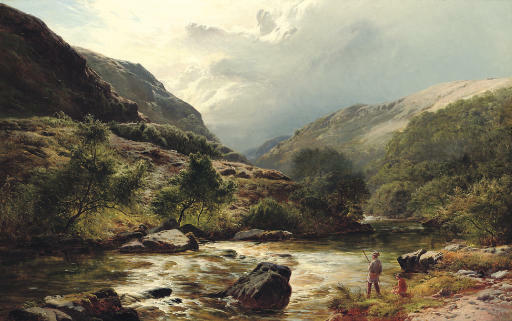 This painting portrays similar topography to that of another work by the artist depicting the River Falloch in Scotland. Percy was born into an artistic dynasty: he was the son of the landscape artist, Edward Williams, and one of six brothers, all of whom were accomplished painters. He was also related to James Ward R.A., George Morland and the renowned engraver, William Ward A.R.A. His first sucessful showing at the Royal Academy was in 1842, at the age of twenty years, and he continued exhibiting there for the next forty years. He was also an important exhibitor at the Society of British Artists, the British Institution and many other exhibitions in London and the provinces. We are grateful to Michael Knowles, O.B.E., for his help in preparing this catalogue entry.